* Lokkee is operated by Tunglok Group. 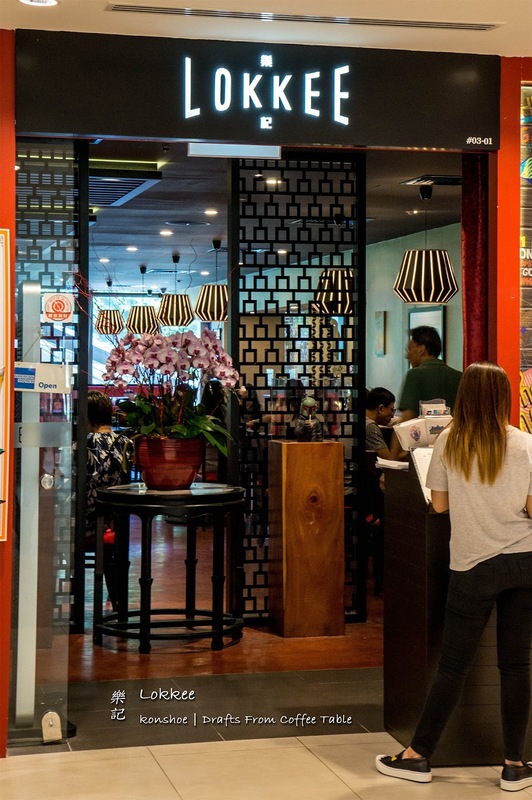 Other reviewed eateries from the same group include TungLok XiHé Peking Duck and TungLok Signatures. Bored by plain old food servings? 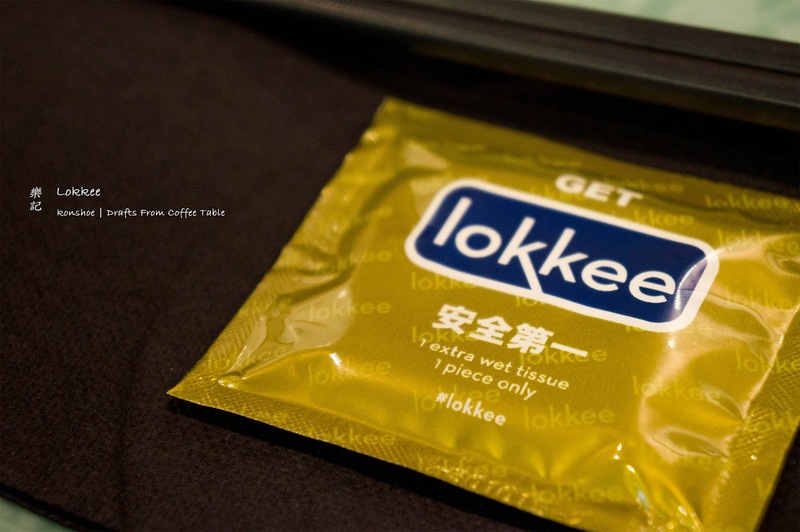 Then perhaps you should give Lokkee a try! 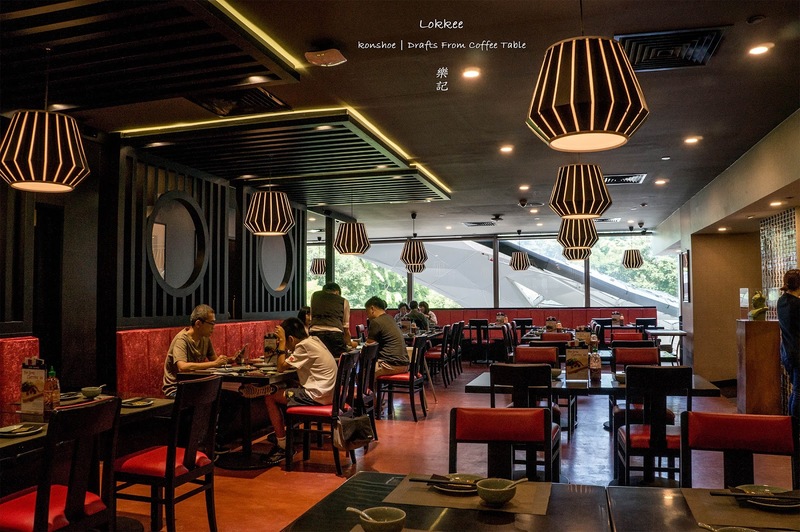 I know I was definitely surprised by their novel take on the presentation of fusion food when I first visited them, so much so that I definitely want to write a post as soon as I finish dining. Perhaps I should start from the beginning. From the entrance Lokkee looked just like any Chinese restaurant albeit with a tad more decor. However my sharp eye saw a bust of Boba Fett sipping bubble milk tea and my interest was piqued. It wasn't until I was seated within that I realized that the contrasting tone set by Lokkee was hip to the max! Lokkee's logo, framed by two stone lions at each side, looks like a traditional Chinese restaurant. Do not be tricked by this: this is definitely anything BUT traditional! Lokkee's interior is spacious, and there is private area for large groups and for private celebrations. If you were to take note of their Chinese ink wash paintings, you would notice that they are not your usual Chinese paintings. 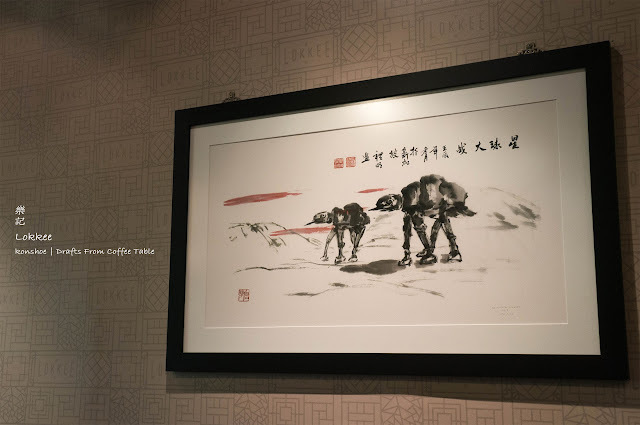 Pop cultural scenes made their way into traditional paintings, such as this Star Wars of AT-AT walkers. There is another one with R2-D2 and C-3PO, and another painting of an Alien xenomorph. No, there is nothing 18SX about this. It is just a pack of wet tissue. I was there to fill my tummy, so decor was still just sight for sore eye, not for growling tummy. We only could finish 2 dishes so decided to be adventurous with Firecracker Chicken Nest (SGD26), and then a Kai Lan with Garlic Sauce (SGD16) on the safe side (in case the nest is not what we expected...). To quench our thirst, we got the plainer Osmanthus Iced Tea (SGD4.50) and the fantastic Ultravoilet Oolong Iced Tea (SGD4.50), which I definitely recommend for its visual effect and taste. 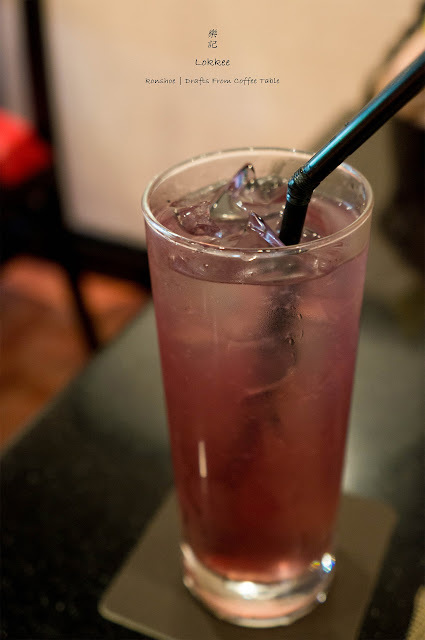 It was the first time ever for me to see a glass of iced Chinese tea changing color after applying some syrup to it! Their food was great albeit not receiving full marks from me. 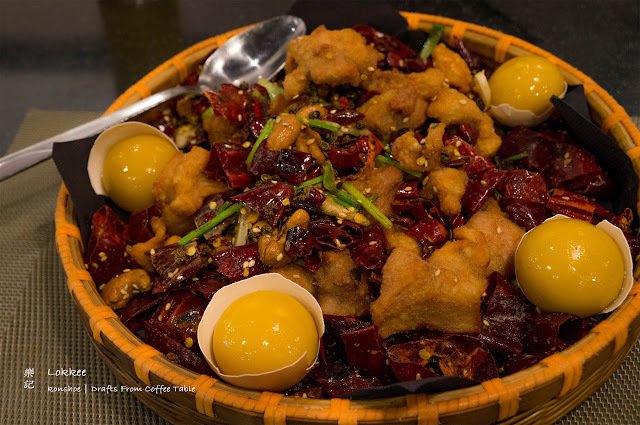 Their presentation was novel - the nest of crunchy deep fried diced chicken was served with mango puree in the form of yolks, with egg shells to complete the illusion, while the dish of kai lan had the leaves fried to a crunchy finish. Still the fact that their taste was not strong (chicken not spicy enough, garlic sauce on kai lan did not stand out) was where I was slightly disappointed. 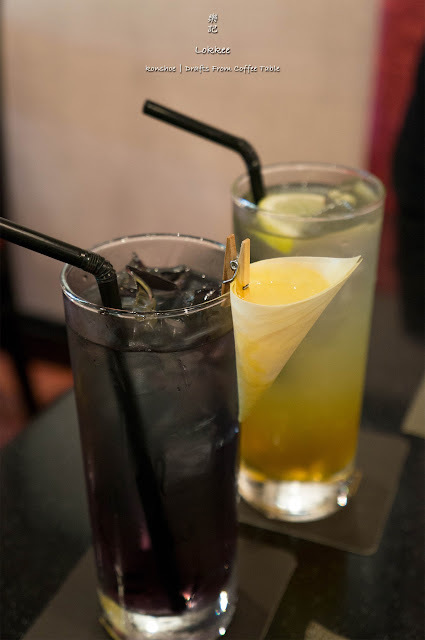 Ultraviolet Oolong Iced Tea (SGD4.50) in the foreground and Osmanthus Iced Tea (SGD4.50) at the back. The latter is a soothing glass of iced tea suitable as a stand in for lemon tea, but it is the former that impressed me. Read below for how it got its "ultraviolet". First pour in the lemon juice and watch the milky white fluid mix into the black Oolong Tea. After that stir for a while and the mixture of black and white will turn into an "ultraviolet" glass of Oolong Tea. Visual effect aside, this is a nice glass of oolong tea but with the sweet lemon syrup countering the usually bitter oolong taste. Firecracker Chicken Nest (SGD26) is pure awesome! Fittingly named, the dish is served in a basket (reminiscent of the namesake nest), the crispy and spicy deep fried chicken chunks covered in dried chilies. To finish the illusion, bulbs of mango puree are placed on top of egg shells to convince diners that they are egg yolks. I loved chicken's cruchiness but would prefer them to be a tad more spicy (they are not spicy enough for this Malaysian tongue). The mango puree bulbs, while nice to look at, can get a little too nauseous if applied too much. Its sweet sensation does counter the spiciness and is a life saver for those not too inclined to spicy dishes. Lokkee shows how to make a simple dish nice with their ‘Kai Lan’ with Garlic Sauce (SGD16). A plate of kai lan (or Chinese broccoli) is stir-fried with garlic sauce, and to notch it up, most of the leaves are fried to a crunchy finish. 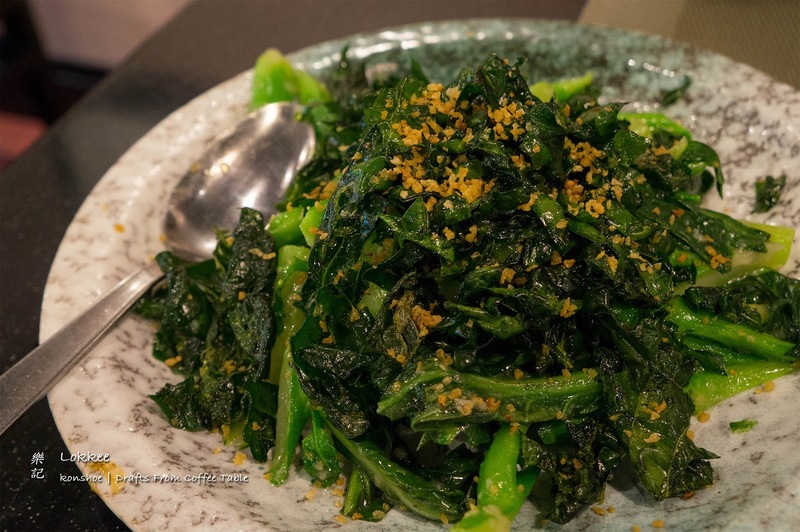 With sprinkle of fried chopped garlic over the greens, this could have been my favorite kai lan dish, if not for the almost lacking taste of garlic, which should have been the highlight of this offering. My favorite kind of dish sharing this name would be one with a moderate amount of thick garlic sauce, enough to flood my palate with its taste to make Dracula cry out in horror. 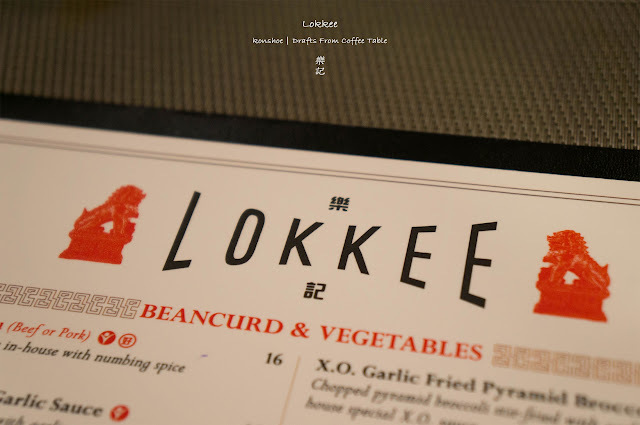 Lokkee is perhaps the hippest Chinese restaurant I have been to. Their offered dishes may not be the best I have tried but they definitely are one of the freshest idea I have seen. They have redefined the meaning of fusion food, a term usually invoke images of western fried rice or some chops with Chinese side dishes or gravy. What Lokkee offered is what I would imagine fusion food should be. Operating hours: (daily lunch) 11.00 a.m. - 3.00 p.m.
(daily dinner) 5.30 p.m. - 10.00 p.m. Directions: Disembark at Dhoby Ghaut MRT station and make your way up the escalator. Head towards level 3 and you should see the restaurant near the escalator.